With an Atlas, Tiguan, and no more Touareg, this is the least VW can do. Volkswagen has a glaring problem within its US lineup that can be seen as soon as you take a look at the SUVs it currently has on sale. There, you will spot the Tiguan, Atlas, and….well, that’s actually it. 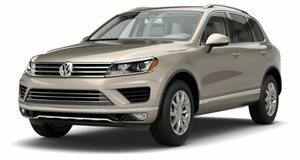 After throwing the Touareg into the trash bin and forcing the Tiguan to do all the heavy lifting by catering to every segment below the Atlas, there’s still a noticeable gap that VW needs to quell to be successful in the US. That's a gap it has just tried to quell with an all-new SUV based on a previous concept of the same name, the T-Roc. From a distance, the small SUV seems to have it all, good looks, a wide front end and sporty proportions, a slew of standard driver aids and comfort features, and even a wide array of engine options that can be had with Volkswagen’s 4Motion all-wheel drive system. Dr Herbert Diess, Chairman of the Volkswagen Brand Board of Management, can’t seem to get enough of it. "The T-Roc sets a new benchmark in the booming SUV segment,” he said. “With its functionality, dynamic handling and technology, the T-Roc embodies all good Volkswagen qualities. It marks a milestone in our SUV offensive.” That offensive, in this case, is underpinned by Volkswagen’s versatile and proven MQB platform. Unfortunately for fans of the T-Roc concept that debuted back during the 2014 Geneva Motor Show, some of the toys seen on that car have been axed for production practicality. That means no removable hardtop roof and no absent B-pillars. Instead, there are six engine options, three turbocharged gas units and three turbo diesels, all of which come mated to a seven-speed dual-clutch transmission or a manual for smaller engines, both sending power to the front wheels when 4Motion isn't installed. Positioned below the Tiguan SUV, the T-Roc strikes a balance with hatchback-like proportions albeit with more ability to stow. With the 60/40 split folding rear seats up, there’s only 15. 7 cubic feet of luggage space. If rear passengers aren't needed, that can be expanded to 45.5 cubic feet. Base models come with quite a few driver aids such as Front Assist area monitoring with City Emergency Braking and Pedestrian Monitoring, Automatic Post-Collision Braking System, and Lane Assist. Two different but equal higher trims are offered, Style and Sport, which personalize the T-Roc with interior and exterior decorative features in line with their trim names. Now here’s the catch, the T-Roc won't be offered in the US. Previous reports confirmed a T-Roc for America in 2019, but whether or not that ends up happening, Volkswagen hasn’t announced it this time around. For now, keep your fingers crossed or try for a European visa if you want to drive it. The Touareg was never right for the US market, and VW is finally ready to succeed.